Once the gathering place of celebrities from around the world, this ultra luxurious six bedroom beachfront villa inside a gated resort setting features distinctive decoration and unparalleled views. Two curving stairwells lead you from the second floor terrace onto the clear blue waters of the magnificent pool. Just a few yards away you can enjoy the convenience of your private beach leading to the beautiful Cofresi beach. 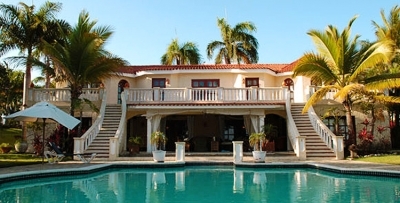 This incredible beachfront luxury villa makes for the perfect Caribbean rental for family gatherings and groups. Featuring a private beach, six fully air conditioned luxury bedroom suites and an Olympic size pool, Casa Piloto offers you the convenience of being inside a five star resort and the exclusivity of your own private villa. Once you meet our staff you will soon discover that they are among the most dedicated and friendly people in the Caribbean. You will feel welcomed every day and greeted with a smile as you enjoy this wonderful Caribbean paradise. Puerto Plata is for those seeking an excitement filled, active vacation with the option of lots of places to visit in the vicinity. Its centrally located airport (POP) is less than a 20 minutes from most hotels. Choose Puerto Plata if you like to explore. Lupern, Maimn, Cofres, Playa Dorada, Costa Dorada are the main tourism enclaves located near Puerto Plata city. Sosua and Cabarete are about half an hour away. Cofres is located west of Puerto Plata City and is an enclave of several smaller hotels and residential communities sharing Cofres Beach. Many visit the city to see the historic fort, Fuerte de San Felipe, and the Victorian gingerbread like mansions from the late 1800's, located in the older part of the city. There is a two kilometre boardwalk, or Malecn, lined with typical Dominican restaurants, where you can take a walk and enjoy views of the port and the Atlantic Ocean. Popular attractions include the Amber Museum of Puerto Plata, the Brugal Rum Distillery, where they offer guided tours of how their rum is made; Central and Independence Parks, where you can see city residents enjoy a break from the mid-day sun under the shade of trees; and Mount Isabel de Torres , the mountain located just behind Puerto Plata. You can take a gondola/cable car to the top which will provide you with spectacular views of the city and surround area. Once at the top, you will find the statue of Christ the Redeemer and beautiful botanical gardens. All bedrooms are air conditioned and include satellite television. Exquisitely prepared by our gourmet chefs and beautifully presented, our meal plan includes all meals while in residence and feature a generous assortment of delicious international and local dishes prepared to your liking. Our meal plan also includes a generous supply of daily snacks, wine at dinner (limit one bottle per two adults per night), one starter case of Presidente beer (each case contains 24, 12 ounce bottles) and two litres of Rum Brugal. Upon arrival, you will be welcomed by our staff with complete cocktail bar that includes pina coladas local drinks and hors d'oeurves. Our bar is stocked with a wide variety of spirits and liquors such as vodka, scotch, gin, whiskey and rums and is always open and available to all guests while in residence. There is a one-time open bottle charge of cost plus 15%. You will not be paying hotel prices for your drinks. Breakfast mostly includes a choice of cereals, breads, fresh fruits, juices, eggs, omelets, pancakes, milk, coffee and other local fresh items. Lunch typically features local dishes, roasted chicken, pizza, pasta, hamburgers and fresh vegetables, salads and desert. Dinner is based on theme nights and are set in a variety of locations. Examples of our theme nights include but are not limited to our pool side or backyard barbecue, authentic pig roast night, surf and turf, Italian night and our popular Dominican style dinner buffet for unforgettable Caribbean experience. $69 per night for adults. $29 per night for children. $45 per night for children. $125 per day (excludes the cost of food, one chef per 15 adults).